It’s a new era at Arsenal, and we’ve got their 2018/19 season previewed in depth right here. Well, you can’t start anywhere but here for Arsenal, who changed manager for the first time in 22 years this summer as they said au revoir to Arsene Wenger and hola to Unai Emery. The Spanish tactician maybe isn’t the name many fans were expecting, but he looks an intriguing appointment who should represent a major change from the Wenger era. While Wenger was somewhat relaxed on the training ground, putting an emphasis on players expressing themselves, Emery is much more hands-on and likes his teams to play to a strict plan. 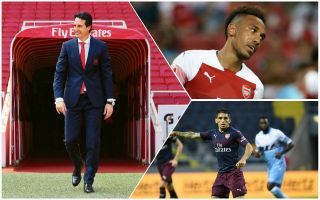 An intense and demanding perfectionist in the Pep Guardiola or Antonio Conte mould, Emery looks the archetypal modern coach and could yet emulate their success. The 46-year-old’s biggest success came at Sevilla, where he won a remarkable three Europa League titles in a row with a side that was more than the sum of its parts – built on the cheap, but well organised and instilled with real work ethic and team spirit. If that doesn’t sound like exactly what Arsenal are crying out for, then we don’t know what is. The Independent are among those who reported of former Gunners midfielder Mikel Arteta long looking the favourite for the job, though Emery eventually emerged as the outstanding candidate as Ivan Gazidis spoke of his extremely impressive interview. This is unknown territory for Arsenal after over two decades of Wenger, and while it’s next to impossible to tell how it will go, that’s part of the charm for Gooners as they finally escape Groundhog Day and prepare for an unpredictable season for what feels like forever. Not huge amounts spent, as usual, but some promising signings made by Arsenal to key areas. Bernd Leno comes in in goal, and fans will hope that is with the aim of replacing struggling veteran Petr Cech as number one after impressing at previous club Bayer Leverkusen. Lucas Torreira looks an exciting addition in midfield, with the young Uruguayan surely an upgrade on the likes of Granit Xhaka and Mohamed Elneny, who have not impressed in that role, while Jack Wilshere’s departure to West Ham left a big gap to be filled. Experienced defenders Sokratis Papastathopoulos and Stephan Lichtsteiner have come in at the back and should prove solid squad players if nothing more, while Matteo Guendouzi looks a very promising young player with some strong pre-season performances in midfield. How would you rate Arsenal's transfer window? Based on a quietly impressive second half of last season, we’d have to go with striker Pierre-Emerick Aubameyang as Arsenal’s most valuable player for the season ahead. If the Gabon international can kick on after scoring ten goals in his first 13 league appearances in English football, then the Gunners will have a very deadly centre-forward on their hands indeed. Aubameyang was one of the most prolific attackers in Europe at Borussia Dortmund and should only improve with Arsenal now under new management, and with a full pre-season behind him to boost his confidence and understanding with his team-mates. There are a couple to choose from here, with Guendouzi, as already noted, looking a very smart signing indeed after arriving in a relatively low-key deal but quickly making a name for himself in pre-season. Apart from that, however, it could be worth keeping an eye on Ainsley Maitland-Niles this season after he made something of a breakthrough last term. The Evening Standard are among those to report on Emery seeming to know a lot about the versatile 20-year-old, who can play midfield or full-back to good effect, and may well get more of a chance at left-back after the injury sustained by Sead Kolasinac. Reiss Nelson is another rising star who got a look-in last season and has again been part of the first-team set-up in pre-season this year. Wenger may be gone, but Arsenal really are spoilt for choice with their conveyor belt of promising talent coming through.